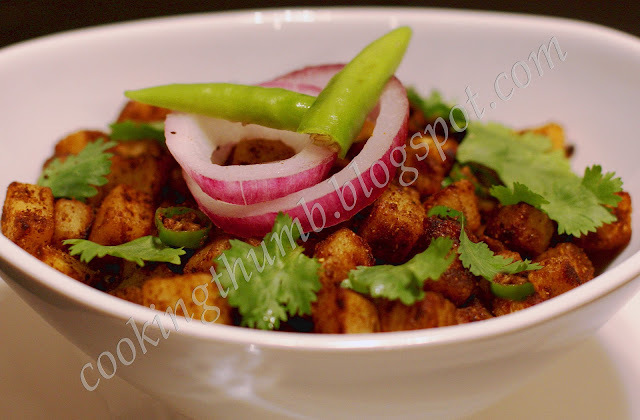 Sukhe Aloo (stir-fried potatoes) is a busy housewife's dream - really quick and simple to prepare and has a great spicy & tangy taste. This utilitarian dish is very popular in households in North India. My favorite way of serving this dish is along with Puri at breakfast, but Sukhe Aloo is suitable for multiple occasions - as a lunch or dinner accompaniment with Roti/Paratha and dal (lentil curry), during long travel, in kids' lunchboxes, or for picnics. Sukhe Aloo tastes great even when served at room temperature. During my childhood days, my family would make a long train journey every year to visit our hometown. Invariably, my mom packed large quantities of Sukhe Aloo with Puris (there were no dining cars in Indian trains in those days). This simple meal was a feast as the train chugged along across the Indian hinterland. Cut the potatoes into 1" cubes. Keep aside. Heat oil in a non-stick pan on medium heat. Add all the ingredients (except cilantro leaves & potatoes). Mix well. Add the potato cubes. Mix well such that the potato cubes get well-coated with spices. Lower the heat. Cover & cook till the potatoes are soft while stirring at intervals. Adjust the salt as per your taste. Transfer it to a bowl. Garnish with chopped cilantro leaves. Serve hot with puri, paratha or roti. Tried this...turned out great! Thanks! Excellent recipe! Thanks for sharing.